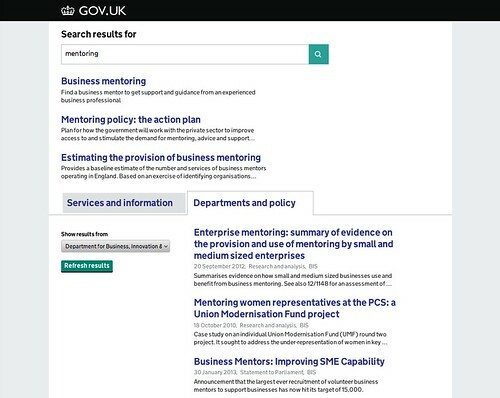 In the past few weeks, a small team in the Government Digital Service has been working to make significant improvements to site search on GOV.UK. When GOV.UK came out of beta in October 2012, replacing the Directgov and Business Link websites, there were around 3,800 pieces of content. Six months on, and the bringing together of information from 24 departments and 31 agencies has added around 52,000 additional documents. 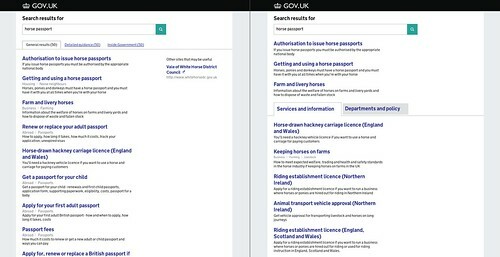 In that time, it's become even harder for users to find what they’re looking for using site search on GOV.UK. And our analytics data and user feedback have consistently told us that search simply hasn’t been good enough. Time for some improvements. Here's what we've done in the past couple of months. Based on existing user testing, user feedback and analytics, the team captured a list of user needs. We pulled together everything we already knew from our research to create 5 personas based on real user behaviour. This helped us to consider the needs of different types of users - from people with limited internet experience through to professionals who use the site every day for their work. Our analytics helped us understand our users’ searching behaviour before we started work. We ran four rounds of user testing with participants recruited to represent users with a range of different needs. Week by week, we’ve added and improved new features based on the feedback and behaviour we’ve seen in our lab, making changes based on what we’ve learned. We've also tested our search results against our simple ‘health check’ tool (which verifies that the expected results appear for specific search terms) to prevent us accidentally making things worse. Some of the most frequent users of search on GOV.UK are researchers and other civil servants, often trying to use GOV.UK every day to find specific content to help them do their jobs. We’ve got lots of ideas for improvements (including better support for exact phrase matching, supporting search operators and providing more detailed filtering options) but for now we’ve added the ability for users to filter results by department/organisation. Probably our biggest improvement so far is improving the algorithm to drastically reduce the number of irrelevant results. We know that almost half of site searches on GOV.UK use 2 or 3 words. Additional words in a search query are often intended to narrow down a set of results to a more specific set of results (eg horse passports vs. passports) but instead we were returning results containing any of the words, which would often draw in many irrelevant results and frustrate users. We've now tweaked the search behaviour to ensure that adding terms narrows down the search results, reducing the number of irrelevant results. In the future, we’re also looking at automatically handling misspellings and offering a ‘did you mean?’ suggestion. Making progress in the past few weeks has involved a fair bit of tidying up. We've made it easier to make it even better in future. We're still not finished. We'll continue to analyse the data and test our improved search with users, and we've already uncovered a list of additional improvements and new features that we think will make search even better. I am one of the "power users" you mention - do you offer any guidance/training support? My fellow researchers and I often struggle to find the specific documentation we need - much of it historical - and I'm also looking to devise some training for our end users (lawyers in a law firm). It would be useful for us to speak or liaise with someone who can advise us on expert searching, and perhaps the criteria you use for what material is and is not included. Hi Lisa - many thanks for your feedback. We have many improvements planned which will improve the search experience further. May I suggest starting each (non-bullet) point with a capital? As you're not using bullet points (I'd be interested to know why) or full stops or semi-colons (which can give a cluttered look), they would help distinguish individual points, especially if a few are one line long. Can you see any bullets in the blog post at all? (There are lots, though they so hang off the left rather than indenting the text.) It sounds like you can't. Where are they missing for you? Hi. Thanks for including us in an internal discussion about bulletpoints. But should it really be open to everyone? To those of us concerned with page layouts it IS a matter of life, though admittedly not of death. I can't see any bullet points at all (I'm using IE8/PC). Thanks Charlie. Yep. We've recently upgraded elasticsearch in order to take advantage of this and other features. Listening to user feedback and acting on it in a productive, measurable manner. I can vouch for the improvement, in a recent discussion regarding pointing people at .Gov for some of the documents we currently host I discounted the idea because it was impossible to get meaningful results for subsequent related searches. You had to go back to google to stand any chance of finding what you want. Having just performed a similar search I got the result I wanted and more related results. Happy to share the specifics if you need the info. Thanks, again, for your openness! I got curious about your health check’ tool . What is that? Another ting: Have you considered Google Site Search? Or compared your solution to it? Hi Jon. The health check is an internal testing tool which verifies that known 'good' search results appear for specific search terms. It's essentially a safety net that automates the checking of some expected results for a long list of search terms when we test changes. Regarding Google Site Search, we've decided that the setting of Adsense cookies by Google Site Search isn't acceptable on GOV.UK. But Google Analytics cookies are OK? What is the actual difference? No mention of the technology stack delivering your search capabilities. Any insights into this?